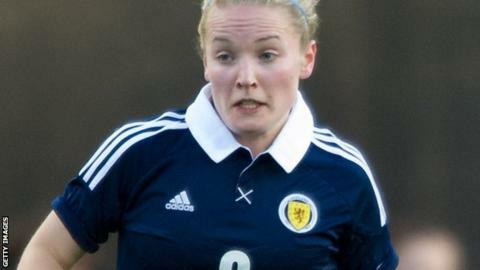 Scotland claimed fifth place in the Cyprus Cup as they beat 10-woman Netherlands 1-0 on the final day. Striker Kim Little shot the Scots in front 11 minutes after Mirte Roelvink had been dismissed for a challenge from behind on winger Emma Mitchell. It was a fine result for the Scots, ranked 14th in the world, against a team nine places above them. Head coach Anna Signeul said: "We played very well in the first half, but towards the end of the game we tired." She added: "We did well to keep the lead. "We were quite composed in attack and defence, and, after beating Italy and drawing with England, it has been an excellent tournament for us." Northern Ireland finished bottom of the 12-nation tournament, their final game ending in a penalty shoot-out defeat by South Africa after a 1-1 draw. Julie Nelson headed the Irish in front after just two minutes and they were within a minute of victory when Nocane Skiti hit a last-gasp equaliser. The South Africans then won the penalty shoot-out 5-4 to leave Alfie Wylie's team with a record of four defeats from their four games. Manager Wylie said: "We had good chances to increase our lead and should have won, so it was a disappointing end to the tournament. "But we came out here without five regular starters and a number of girls have had to play in all four games, which is far from ideal. "Bearing that in mind, then together with the effort and commitment shown by all of the players, there are positives to take."